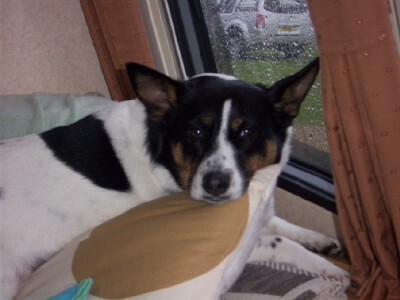 This is the page for all caravanning pets! Take a look at some of the other pages we have which all relate to taking your pets on holiday with you. Our dog Becky always comes on holiday with us! Have a read of her "Dog Blog"! The Dicky Bag - Revolutionising the dog walk. Whether you're using it to store your phone, wallet, keys, ball, leads or the original idea POOP you can enjoy your walk hands free, easily safely and odourlessly. Muksak specialises in making time out with the family pet a more fragrant experience! You can now take your pet abroad with you with the "Pet Travel Scheme". Find out more here. If you have a great picture of your caravanning pets, email it to us and we will add it to this page! Do you take your pet caravanning? Do you have a great story about this? Share it with us and all the other Caravan Advice readers and pet lovers! Do you have a picture to add? - We'd love to see one! Great! Click the button and find it on your computer. Then select it. Our two border collies Lilly & Taff love going away in our van and some times their cousins Toby and Rocko come along too!